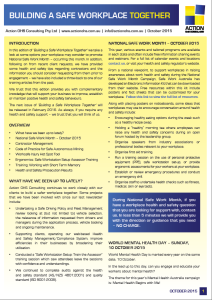 Please find Action OHS Consulting’s October 2015 edition of our 4-monthly newsletter Building a Safe Workplace Together. In this edition we take a look at: contractor management and what all businesses large and small should consider; the recently updated WorkSafe Victoria’s updated Injury Hot Spots tool; factors that impact long term learning – do you consider the impacts of “blocked” and “random” practice when developing your training programs? along with two recent health and safety prosecution results.